appareils en acier, ventilateurs de plafond dans toutes les chambres, climatisation centrale, couverts porche trex, grande terrasse Trex de jardin avec store électrique en option. 15 minutes en dehors ny hudson et à 25 minutes de Rhinebeck. 30 minutes de Ski et à 5 minutes du lac Taghkanic parc d'état. Profitez des magnifiques vignobles de la vallée hudson et antiquaires. Promenez-vous sur warren er ou profiter de la foire du comté de Dutchess en août. Beaux endroits à manger dans la région et une abondance de place cultiver des fruits et légumes se dresse / marchés de producteurs, ainsi que des sites historiques à voir le long de la rivière Hudson et dans toute la région. We stayed here in order to visit Rhinebeck for the Sheep and Wool Festival. We found the location perfect for all we decided to do. The drive to Hudson is quick and we were able to find everything we needed near by. The house is in the woods and so peaceful. Everything is cared for and the owner was responsive and made us feel at home. Definitely a do-over. 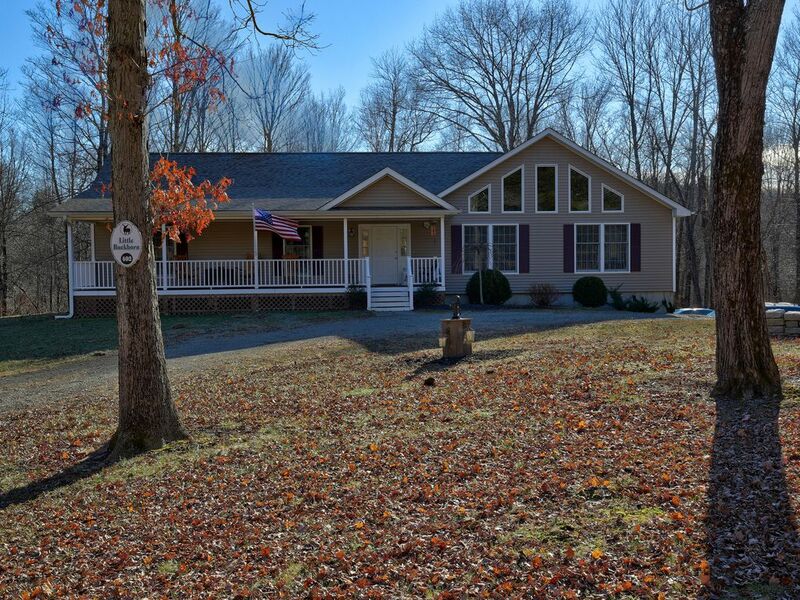 The house was really nice - comfortable, very clean, had everything you need, very private, beautiful property really set in nature with wonderful front and back porches to admire it all. The house was well-appointed. The owner, Tony, was friendly, helpful, and responsive, and he even left us a nice bottle of wine - thanks Tony! What a terrific place! Immaculate, very comfortable, beautiful kitchen and expansive deck. This is a truly special home with open floor plan, enormous kitchen, huge selection of movies for a rainy day, great deck to enjoy a beer or glass of wine and watch the deer walk through the yard. Tony was a terrifically accommodating host. I will definitely be staying again! Thanks Chandler, glad you enjoyed your stay, you are always welcome, see you next time. Tony's house is easily accessible (just off Taconic pkwy), close to a large grocery store (less than 10min drive), and plenty of Hudson Valley/Catskill towns to visit. The house itself is clean and the property is nice and secluded. Good place to relax and get out of the city. Very nicely maintained home, both peaceful and quiet. Off the beaten path, giving us time to re-charge. Many different birds about including hummingbirds, yellow finches, bluebirds, and other various songbirds. Weather was low 80's with hardly any humidity, and truly very comfortable. Noticed no mosquitos, and enjoyed dinner outside on the deck every night, without worry of being pestered. Enjoyed seeing deer there daily (including fawns and a buck in velvet), and even a coyote was spotted scooting down the dirt road up front, and chipmunks all about. Went to Taghkanic Park, Kaaterskill Falls, and down to a Lighthouse somewhere along the Hudson. We took a ride to Woodstock to check out the scenery, and headed up to Hunter Mountain to ride the ziplines all the way back down. Various golf courses close by, and played 18 holes at Red Hook which was about 1/2 hour away. Nice course (saw deer there too), and not very crowded mid-week when we went. Thanks for the recommendation, Tony! And thanks for checking in and taking good care of us, appreciate it! Had a great time overall, and looking forward to coming back soon. We could not have been happier with the accommodations. The house is large, comfortable, and in excellent, clean condition. It had everything we needed. It's located in a quiet, relaxing, rural area surrounded by woods but is still within a few minutes of just about anything you'll need. The weather was rainy and we were unable to hike or canoe so we took advantage of visiting Kaaterskill Falls (Spruce Creek), the Thomas Cole (Catskill) and Olana State Historical Sites (Olana), the Norman Rockwell Museum and studio (Stockbridge, MA), Woodstock, NY and the Culinary Institute of America in Hyde Park, all of which are in the Hudson River Valley and within an hour's drive or less. The area is beautiful! If you are an art enthusiast and/or love the outdoors, you will love it. It would be a great destination for motorcyclists because of the winding, curvy, hilly roads. The host was very responsive and accommodating. He truly wants you to enjoy your stay and will do everything to make that happen. It was a great vacation. guests booking the entire month of either June, July or August 2017 will receive a 10% discount off the monthly rate of $7000.